If you have seen raccoons or squirrels too close to your home, or if you’ve been hearing scratching noises in the walls or ceilings, you may need to take wildlife control measures. Wild animals are wonderful, as long as they aren’t in your home; then they’re bothersome and can threaten the health and safety of humans. Wildlife can be destructive to homes. They dig holes, chew through walls, ducts, or wires, and defecate in the home. These problems can create even bigger problems, such as fires and floods. They also cause health problems. Wildlife can carry diseases and parasites, including rabies, hantavirus, Lyme disease, fleas, and ticks. The best course of action is to have the wildlife removed. Wildlife control is more necessary than ever because humans keep spreading into territory that wildlife calls home. This often causes conflict between humans and animals. At Critter Control, we work to resolve these conflicts in a humane, safe way. We use nonlethal methods to remove the animals and do everything we can to minimize stress to the animals and our clients. As a wildlife control company, we work with customers through education, home inspections, animal removal and post-removal restoration. We have a seasoned team of experts who can identify your animal invader and remove it. We then seal up the entry points to keep any other animals from returning. 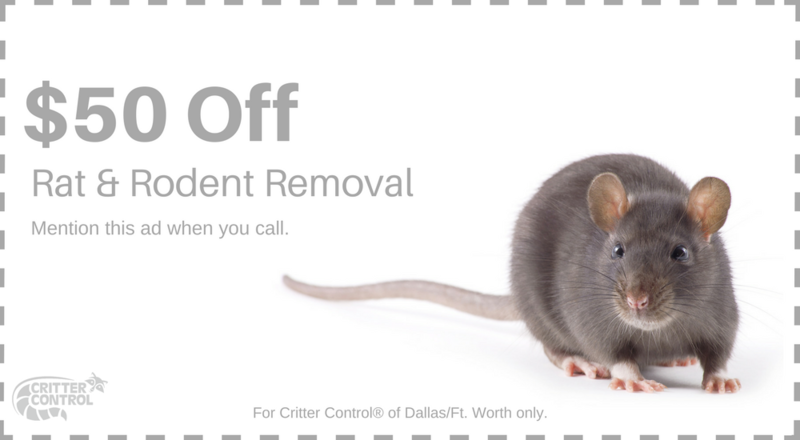 Contact us at Critter Control or call 24/7 at 469.805.6267 should you have any wildlife control issues. Rely on our trained experts to remove your wildlife safely.